Next Jay Z and Kanye West: Too Cultured for Rap? A few years back, the eminent art historian of modernism, Yve-Alain Bois, gave a lecture in which he pointed out the dangers of what he called “pseudomorphism.” As the word suggests, Bois was concerned about things that might look alike and suggest a false positive of causation or meaning. He was talking about the old discussion around whether modernist painting was actually structurally related to “primitive art” or just looked a lot like it. There is a risk, for example, that we might think a Picasso guitar is a Grebo mask because, frankly, there are only so many shapes in the world, and if you look hard enough, unrelated objects start to look pretty similar, setting the mind ablaze with causation where there is only visual similarity. Pseudomorphism is, ultimately, the foundation of a lot of lazy art criticism, bad art history classes (“This looks like that; discuss amongst yourselves”) and fun barroom conversations. For their part, the original Star Wars films have long provided the grist for slapdash associations and slacker academicism. Why shouldn’t they? They incorporate what is arguably the most recognizable film iconography of our generation and work through the “big questions” using predictable allegory dressed up in two mainstream cinematic genres: western and sci-fi. They are pop culture Rorschach tests, sites of near infinite projection for whatever our moods or the zeitgeist demand. Who can forget Randall and Dante’s conversation from Clerks in which the construction of the Death Star in Return of the Jedi becomes a jeremiad on the collateral damage of insurgent warfare? In A New Hope, Randall notes, the Death Star was all Imperial dignitaries and stormtroopers — combatants on a military installation; in Jedi, the semi-completed planet-destroyer was likely awash with hapless contractors. Here, George Lucas’s neat “just war” is made suddenly morally ambiguous. Such conversations are all in good fun, especially between video store clerks or after a late night of substance abuse. 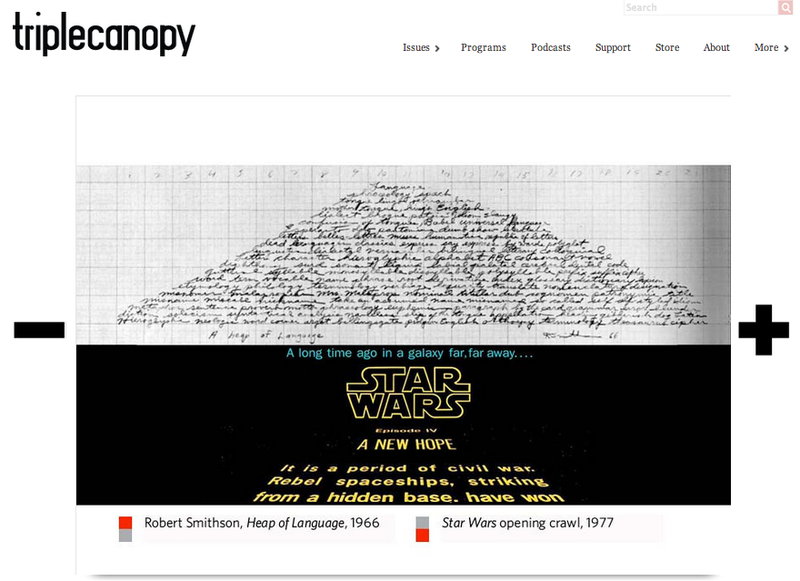 I suspect artist John Powers was having similar fun in his epically long analysis for Triple Canopy, “A New Heap,” in which he reads the history of modernism and minimalism through the design of Star Wars and 2001: A Space Odyssey. But unlike Randall’s stoner screed, this essay comes fully footnoted, uses serious language and is partially argued visually, putting images of 1960s minimalist art and urban housing projects next to pictures of X-wings, Imperial Star Destroyers, Han Solo’s Millennium Falcon and the Death Star itself. 2. This was largely accomplished through a recourse to minimalist sculptural forms, which are antimodernist, and provide the design vocabulary of such films. The second point — that minimalism had something to do with this — is free-spirited pseudomorphism at its best. 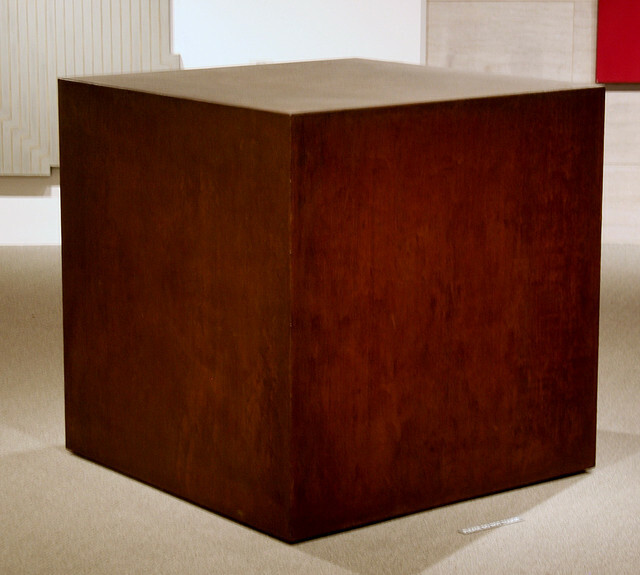 As previously mentioned, there are only so many shapes in the world, and when dealing with sculptures that are defiantly primary — monochrome boxes and cylinders — it’s easy to start seeing James Turrell and Robert Morris in the maniacal engineering of the Imperial Armada. Superficially, there’s a bit of rehash at work here: The very real connections between Utopian architecture gone awry, modernism’s anti-regionalist and colonial ambitions, and its space-age lust for speed and progress are all very well documented here, here, here and here. Nevertheless, there are a few brief points to make about modernism, minimalism and Star Wars. 3. Formalism, which emerged after the war when America became the de facto art capital, and our painters started to make massive, abstract tableaux. This is when critic Clement Greenberg developed an American modernism that prized instantaneity, the visual and the specific elements of each medium — painting was primarily flat and retinal, sculpture primarily volumized and tactile. At least two of these modes are conflated into the Evil Empire of the Death Star in Powers’s piece. Old school European modernism’s conflict about modernity’s relationship to progress and the inside-baseball quality of American formalism are somewhat lost in the shuffle. Also overlooked is that minimalism was arguably a continuation of Clement Greenberg’s modernism itself. And still, there is another branch of minimalism, led by Dan Flavin and Carl Andre, who were unabashedly inspired by the industrial materials and physical movement of that most Utopian modernist of moments: Soviet-era constructivism. That is to say, even in their most “out there” form, minimalists were not exactly anti-modernist, just pursuing it from a different angle. Minimalism had a more complex relationship with American and traditional modernism than Powers lets on. According to many ‘60s artists, it’s not that modernism was bad; it’s that, in conceptual pioneer Joseph Kosuth’s version, a critic such as Greenberg was simply too subjective, his criticism too personal and arbitrary. The austerity, anonymity and rigor of many of the ‘60s “minimalists” (known alternately as primary structure, systematic or ABC artists) was light years from the soft-headed new-age individualism that is the calling card of the Rebel Alliance, from their loose chain of command and duct-tape-and-a-prayer quality fleet to Luke Skywalker’s quest to let go of reason and technology, and get in touch with his inner chi (i.e. the Force) in the swamps of Dagobah. That such mysticism would find natural expression in both the environmental movement and the post-minimal practices foreshadowed by Robert Smithson and known as “earthworks” is unsurprising; Smithson seems a bit of a hero for Powers, and his work and writing is more Rebel Alliance than Evil Empire — but he was neither a modernist nor a minimalist. In other words: Modernism was never so certain of itself, and minimalism never so rebellious. Powers, for his part, locates visual similarities between all of these elements: modernist high-rises, minimalist geometries and Smithson’s organic non-sites and entropic experiments are, for Powers, present in the aesthetics of both the Rebels and the Empire. Here, the first Death Star is part U.N. Building, part urban housing project, part James Turrell sculpture, part Sol Lewitt serial grid. If this seems confusing, it is. One thing I can tell you is the Death Star is not minimalist. Is it a shape? Absolutely. Does it look like a Baroque palace? Nope. Is it industrially austere, like much of our mid-century architecture? Indeed. Does it embody all that is dystopian, alienating and twisted and evil about industrialized imperialism? Of course—Lucas’s moral universe and iconography is nothing if not overt. But the minimalists were interested in art qua art, not working objects with a use function, e.g. conveying plastic-clad troopers and annihilating peaceful star systems. Robert Morris’s “Notes on Sculpture” sums this up neatly, arguing that a sculpture was bigger than an object you could hold, but smaller than a building. Minimalist sculpture had to be contained by architecture and be bigger than the body, but not by much, exemplified by works such as Tony Smith’s “Die.” Needless to say, a Unicron-style planetoid operates not only as architecture, but on an colossally sublime scale. What’s more, Morris famously argued that such sculpture is identifiable by its gestalt, or irreducibility: It is what it is and no more, with no external referent. He and Donald Judd both used grey and red paints to add a seamlessness to such objects. Similarly, the geometric nature of these “primary” forms allowed near infinite combinations of shapes, but also ensured that the work would not be mistaken for, say, an ion cannon, a trash compactor or a poorly guarded exhaust port. Indeed, it was rare for minimalist forms to take on the spherical at all, much less so the dimpled form of a planet inset with a laser-magnifying array — even less so still spheres that, on close inspection, revealed a vast Venetian sprawl of canyon-like canals and functional structures. Like the mythical Cybertron, the Death Star is an entire, chaotic, entropic world. If it were a gestalt form or “specific object,” Luke’s X-wing fighter would have found no purchase, glinting off its impregnable, finite surface. The Death Star, for its part, is a marvel of engineering and seems, if anything, modeled on the geologic scale and organic complexity of our larger terrestrial environment — it just looks much cooler. But, as Cher from Clueless might argue, it’s a “faux Monet”: coherent from afar, an overwhelming mess on close inspection (say, from the gunnery bay of the Millennium Falcon). I could go on, but much like the debates between formalist critics and the minimalist vanguard, the conversation might become both heated and insular. The bigger issue is that the further we get from the 1960s, the less terms such as “minimalist” retain any stable meaning and, by extension, descriptive value. The minimalists themselves never fully embraced the term, and what was then a critic’s coinage has become a kind of retrospective certainty. The minimal in their work might once have been called abstractness or form following function or anti-ornamentalism or modernist industrial design. One could argue that “minimalism” has simply migrated into the vernacular, and just means what it sounds like: stripped down and vaguely European, like an IKEA bookcase. While we can read many things into Star Wars, 1960s sculpture is not one of them — unless, of course, if such references happen on the level of haphazard pastiche. Sadly, that may be the ultimate fate of high minimalism, relegated to clever branding and pseudomorphisist hijinks. Ian Bourland is an art historian and cultural critic. He is an assistant professor at MICA in Baltimore, where he works on modernism and globalization, and writes for a range of institutions and publications. Jay Z and Kanye West: Too Cultured for Rap?